These Custom Glass Water Bottles are completely recyclable, BPA-free, and the Bottles transfer minimal taste or odor. 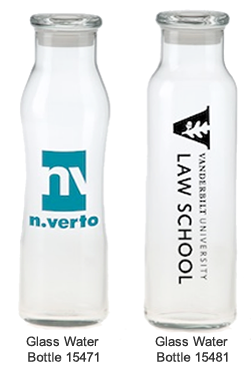 Each Customized Glass Water Bottle features your design and message prominently on the front side of the Bottle. One to multiple color imprints are available. 22 Oz. Curved Wall/Easy-Grip Water Bottles (#15471), which measures 9.625 inches high by 2.813 inches wide. 24 Oz. "Natural" Glass Water Bottles with straight sides (#15481), which measures 9.625 inches high by 2.813 inches wide. Standard production time for our Promotional Glass Water Bottles is about 2 weeks after proof approval. Rush production is available for an additional charge. Pricing for Custom Glass Water Bottles – Call 1-800-233-0828 to Order! 15471 Curved Wall/Easy-Grip Custom Glass Water Bottle, 22 Ounces 4.45 3.79 3.63 3.55 3.49 3.39 5.5" 2.75"
15481 "The Natural" Custom Glass Water Bottle, 24 Ounces 4.45 3.79 3.63 3.55 3.49 3.39 5.5" 2.75"
For more information on our Custom Imprinted Glass Water Bottles, or to get started with your Bottles, simply call 1-800-233-0828 and submit your camera-ready artwork to graphics@kardwell.com. The minimum order is just 72 Water Bottles.